You’ll be familiar with the Where Did Our Money Go? report that’s included in your standard reports every month. This month the corresponding chart is one of the bonus reports – have a look and see things from a different perspective! Like the report, the chart helps you understand how you’ve funded your business and what your major outgoings have been. 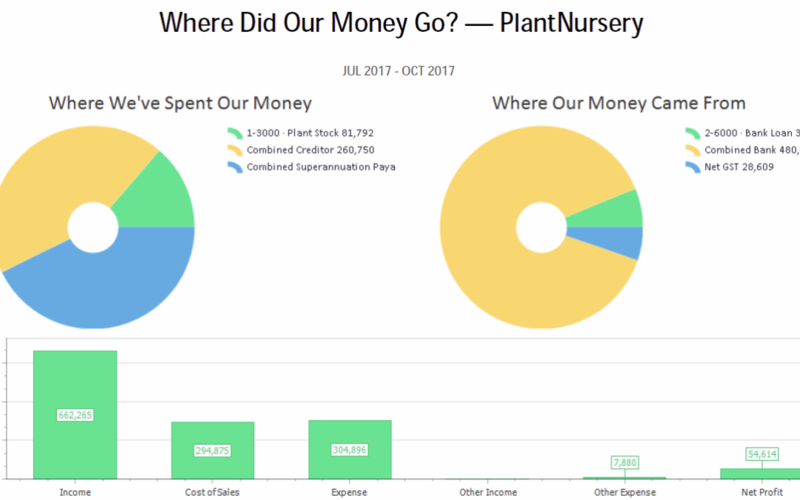 The horizontal chart along the bottom gives you a graphical view of your profit and loss – it’s great to see that your income really is bigger than your cost of sales and expenses! The 2 pie charts are the really interesting part – they show you what’s happened in your balance sheet and that’s really important to understand when thinking about your cashflow. In the example chart here, you’ll see we’ve spent our money on stock (we’ve purchased more than we used up), creditors (we’ve repaid them more than new purchases) and superannuation. These don’t show up in your Profit & Loss so sometimes they’re out of mind when reviewing our accounts but, as you can see, they can make a big difference. How did we fund the business so far this year? In this example, we can see we’ve added a bank loan and GST is sitting on this side, and there’s also a big movement in the bank. It may seem strange to see the bank here but we’ve effectively funded the business by spending money we had in the bank. Sometimes your bank will show in the other pie – where you’ve increased the bank balance and put some away for a rainy day. GST too, can be on either side. In this case, we’ve accrued GST that we’ve collected in our sales, but haven’t yet paid it to the tax office. In effect, we’re borrowing from the tax office (aren’t they nice like that?) to fund our business – but once a quarter (if that’s the schedule you’re on), you’ll see GST on the other side when you make your payment to the tax office. Be aware that you need to look at more than just your net profit and the bank balance to get the whole picture of your business. Familiarity with all your balance sheet movements will give you the full picture and help you understand your business better – then you can grow and expand! Good luck!